The old friary is situated just around the corner from the present one. Remains: church, tower and transept chapel are complete, as are the east range and parts of the cloister; N.B. – the tremendous amount of cut stone and bas-reliefs: the MacMahon tomb in its original form and the parts incorporated into another tomb, St. Francis, the small Ecce Homo, and all the stone work under the tower. The old tradition is that Donnach O’Brien founded Ennis friary on an island near his castle and that the town grew up around both. Be that it may, construction had started before the death of Donnach in 1242. 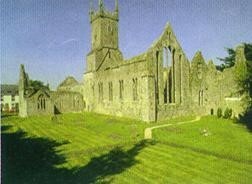 Later Ennis friary became a famous centre of learning. It would seem that it was slow to accept the Observant reform. The house was suppressed in 1543, but the community managed to remain on until 1575. Individual friars still remained, such as ‘The Mad Friar’, Fr. Dermot O’Brien who was certified insane so that he could live within the town about the year 1617. A Small community was established in the area in 1627 and, with the usual interruption in the Cromwellian period lasted right down to the next century. Bow Lane on 12th December, 1830. Following a threat by the Provincial in 1853 that he would close Ennis friary unless conditions were improved, the present site at Willow Bank House was obtained and the first mass was celebrated in the new church there on 1st January 1856. Twenty years later this building was replaced by the present church. Ennis became the official novitiate of the Irish Province from 1876 to 1902, but the history of the novitiate during this period is complex. 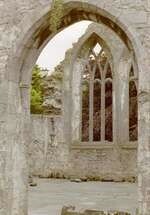 The old medieval friary was returned to the friars as an ecumenical gesture by the Church of Ireland in 1969.